Fig. 264, Fig. 266 and Fig. 265 Water Jet Eductors are designed for liquid pumping and mixing operations and for the handling of some solids. In operation, pressure liquid enters the eductor through the pressure nozzle and produces a high-velocity jet. This jet action creates a vacuum in the line which causes the suction liquid to flow up into the body of the eductor where it is entrained by the pressure liquid. Both liquids are thoroughly mixed in the throat of the eductor and are discharged against back pressure. The streamlined body permits the pressure liquid to move straight through the eductor and reduces the possibility of solids in the suction material from collecting and clogging. Fig. 2645 Automatic Water Jet Eductors are used to pump out sumps (pits, tanks, etc.) where liquid accumulates slowly but must be evacuated when it reaches a predetermined level. Operation of the Fig. 2645 Automatic Water Jet Eductor requires no electrical connections or external power other than motive fluid. 4-inch Fig. 266 Cast Iron Water Jet Eductor Cast iron body and tail, bronze nozzle and throat. Motive Inlet: 2-1/2”, 150# flange. 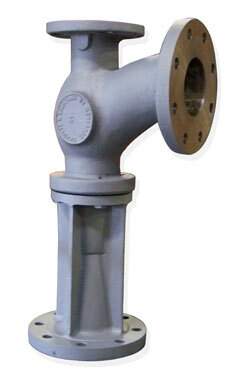 Suction and Discharge Connections: 4", 150# flanges. Unit will use 162 gpm of 85 psig water to handle 340 ft3/hr of solids at a discharge pressure of 5 psig, and 270 ft3/hr of solids at a discharge pressure of 10 psig. Fig. 264, Fig. 266 and Fig. 265 Water Jet Eductors have a low initial cost, are self-priming, have no moving parts, are easy to install, require little or no maintenance, and pump as well as mix liquids. The Fig. 2645 Automatic Water Jet Eductor is self-operated and requires no electrical connections. The snap-action valve and ball float are the only moving parts. Special Automatic Eductors can be made from any other jet eductors. Introduce water treating compound into boiler feed water. Control water level in evaporation in chemical processing. Control level in latex sump in chemical processing. Control level of waste in photo and glass sumps in chemical processing. For more detailed information about Water Jet Eductors, Bulletin 2M & Bulletin 2M Supp. Literature. To submit a Request for Quote (RFQ) for Water Jet Eductors, Adobe PDF or submit an online interactive RFQ Form for Eductor / Syphon. Water jet eductors are often used to empty tanks or to pump out sumps, penstocks, cellars, and the like. The pressure line should be fitted with a regulating stop valve and a pressure gauge while the suction line should be provided with an S&K Strainer. Discharge lines should be sealed for a positive pick-up of the liquid by turning the discharge line up or by submerging the end of the discharge line. It is recommended that the eductor be installed a short distance above the liquid to be handled and that short suction lines be used. Eductors will operate with long suction lines, as shown in the line drawing, however, with suction lifts greater than 15’, capacities are reduced considerably. When handling hot liquid the eductor must be arranged with a short suction line or must be submerged. Fig. 264 Eductor Used in Pumping and Mixing Operations. This illustration shows a typical arrangement used in mixing liquids such as chemicals or fertilizers in proportion for spraying. The solution to be applied is mixed in a container in approximately twice the strength at which it is to be used. The water jet proportioning apparatus is operated by a jet of high pressure water and is controlled by a 3/4” stop valve. A 3” pressure gauge indicates pressure. The jet action of the pressure water draws the solution from the container and the water and solution are mixed in the throat of the eductor and are discharged through a standard 3/4” hose to a spray nozzle. Solids can be handled and sprayed through a non-clogging type spray nozzle. Treating Compound into Boiler Feed Water. This illustration shows a Fig. 264 or Fig. 265 Eductor being used to entrain another liquid. A portion of the water issuing from the pump is bypassed into the eductor where it acts as the pressure medium to draw in and entrain the water treating compound. Fig. 264 or Fig. 265 Eductor Used in Producing Emulsions. This is a system developed for the continuous application of detergent solution to paper mill felts. A Fig. 264 or Fig. 265 Eductor is used to entrain detergent from a drum. This detergent is mixed intimately with the pressure water and the solution is in turn, entrained by a Steam Jet Syphon where it is brought to the desired temperature by mixing with the syphon’s motive steam. The heated solution is discharged through spray jets into the felt.